So far, the 2013 MLS season has presented exciting times for Philadelphia Union forward Jack MacInerney. Tied for the league lead in goals with 10, leading MLS with 5 game-winning goals, the first Union player to be called into the U.S. National Team (Jeff Parke was capped after the Union acquired him, but before he actually played a match with them)…yes, it has been an anno bonum for Jack so far. Besides chasing the MLS Golden Boot award, Jack is also in a position to chase some history. Typically, native-born Americans do not get to figure prominently among league scoring leaders, and this has long been the case with Philadelphia teams. While names like Harold Brittan, Fabri Salcedo, Andy Provan, Dave Robb, and Sebastien LeToux have led their respective Philadelphia sides in goals, very rarely has a native-born U.S. player paced a local footie side in goals scored. However, it has happened. So let’s take a look at the American players Jack Mac is chasing as he looks to add to his goal totals in 2013 (currently at 10 goals in league play, with 1 goal in Open Cup play). Fall River, Mass. 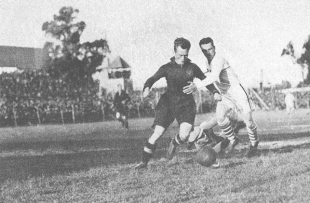 native Patenaude began his professional career, debuting as an 18-year old, with Philadelphia FC in 1928 and scoring six goals in 8 games before being sent away, ultimately, to the Fall River Marksmen, the dominant American Soccer League team of the era. Patenaude went on to score 125 goals in 119 games in his career in the first American Soccer League. Along the way, he was named to the first U.S. World Cup squad in 1930, starring for a squad that finished in third place in that inaugural tournament. In Uruguay, Patenaude netted the first World Cup hat trick, scoring three against Paraguay and netting four through the whole tournament—still the record for a U.S. player in a single tournament. With the collapse of the first ASL, Patenaude signed with Philadelphia German-Americans of the “new” ASL in 1933. By the next year he had moved on to the St. Louis Soccer League, but in 1936 he returned to the ASL with Philadelphia Passon (sponsored by the iconic Passon Sporting Goods store in the city). In his final professional season, Patendaude scored 24 goals while leading Philadelphia to the finals that season, where they lost to Kearny (NJ) Scots. Although the ASL held a league cup tournament from time to time (the Lewis Cup), none was held in 1939. However—while scoring records are not currently available—Philadelphia participated in the U.S. Open Cup that year. As a result, Patenaude’s single-season goal record for an American playing for a Philly team may be higher if all competitions are taken into account. As it stands, his 24 goals in league play remains a record that will not be broken anytime soon. Patenaude was inducted into the National Soccer Hall of Fame in 1971. Philadelphia-born John “Duke” Nanoski joined Kensington Blue Bells soon after graduating from Stetson High. He began his professional career with Brooklyn St. Mary’s Celtic in the ASL in 1938, scoring three goals in Brooklyn’s 5-1 aggregate win over Chicago Bricklayers in the 1939 National Challenge Cup, known today as the US Open Cup. He led the ASL in scoring in 1941-42, notching 20 goals before returning to Philadelphia for the 1942-43 season when he joined Philadelphia Americans, with whom he would play through 1948. Nanoski soon began a fruitful scoring partnership with Bob Gormley, scoring 14 goals to Gormley’s 16 goals in their first season together. In the 1944-45 season, it was Nanoski who was most prolific, leading the league in goals with 22 (in 19 games)—while also adding 16 assists. Nonoski was inducted into the National Soccer Hall of Fame in 1993 along with a player from Brazil that you may have heard of, a fellow by the name of Pele. The successors to the once-dominant Philadelphia Americans sides of the 1940s, the Uhrik Truckers managed one last ASL title in 1955, led by league MVP Jack Ferris. This Philadelphia native learned his soccer playing for Fishtown AC, on the infamous cinder field known as Newt’s. He made his professional debut in 1944 with Philadelphia Nationals at the age of 15, and would also be on the 1960 U.S. Open Cup winning Philadelphia Ukrainian Nationals side. In between, he made appearances with the A’s and, just shy of 30, had a career season with the Truckers in 1955, scoring 20 goals. The Truckers also won the Lewis Cup that year, but there are no records of how many goals Ferris might have scored in the five games of that competition. Similarly, any goal scoring records of the U.S. Open Cup that year are also currently unavailable. Ultimately, Ferris might have more goals than Patenaude did (in all competitions), but for now he has to be content with the second spot on the list. Prior to the 1948 ASL season, the Baltimore Americans folded. Five Baltimore players then signed with the Philadelphia Nationals, including reigning leading scorer Nick Kropfelder. Born in Baltimore in 1923, Kropfelder starred for Loyola College in 1947 before being stripped of his eligibilty for playing professionally with the Americans in 1946. The center forward fit in well with the Nats, scoring 7 goals in his first season with the club, adding three more in the Lewis Cup. Philadelphia won the ASL title and Lewis Cup that year, and just missed being only the second U.S. club to win a treble (Brookhattan, 1945) by losing out to Morgan S.C. of Western Pennsylvania in the U.S. Open Cup final. Kropfelder proved his worth by scoring two goals in the two-leg final, giving him at least 12 goals in all competitions that year (alas, goal scorers for preliminary rounds are not available at this time). In the 1950-51 season, however, Kropfelder exploded for 17 goals, leading the team to another ASL title, as well as yet another Lewis Cup win. He spent two more years with the Nats before returning home to Baltimore to finish out his career with the Baltimore Rockets. Kropfelder was inducted into the U.S. Soccer Hall of Fame in 1996. Older cousin of Philadelphia soccer legend and National Soccer Hall of Famer Len Oliver, Tommy was no slouch in his own right, starring for the Philadelphia Nationals during their run of titles in the late 1940s and early 1950s. Another Philly native, Oliver featured on a Nationals side that—with the exception of Scotsman Eddie McIlveney—was made up entirely of native-born players, an extreme rarity for teams outside of St. Louis in that era. Along with his 16 league goals (second overall to Piro Villanon of Brookhattan) to help the club win the 1949 ASL title, Oliver also scored two goals in the side’s successful Lewis Cup campaign that year, giving him at least 18 in all competitions. He did not score in the Nats’ unsuccessful two-leg U.S. Open Cup final, however, and goal totals for earlier rounds are currently unavailable. Philadelphia soccer history is filled with the names of local kids who went on to star in the professional ranks—Walt Bahr, Len Oliver, Charlie Duccilli, Dave MacWilliams, Chris Albright, and Bobby Convey, to name a few. Somehow, however, the name of Bob Gormley has slipped through the cracks. Gormley was born on August 3, 1918 in Philadelphia, and learned his soccer—as many native Philadelphians did—with the Lighthouse Boys Club in Kensington. In 1933 he signed with the Philadelphia German-Americans—along with Patenaude—but the 15-year old saw only reserve team duty for three years before jumping to the Kensington Blue Bells of the minor Eastern Pennsylvania League. In 1937 he returned to the Germans, scoring 10 goals. He remained with the club through the rest of his career, and was with them when they changed their name, first to “Americans” during the 1941-42 season (prompted, no doubt, by the U.S.’s entry into World War II) and then to Uhrik Truckers in 1953-54. Gormley was a key figure on the A’s 1942, 1944, 1947, 1948, and 1952 title winning teams, as well as the 1943 Lewis Cup winning side. In his 17 years with the club, he served as captain for 12 of them. 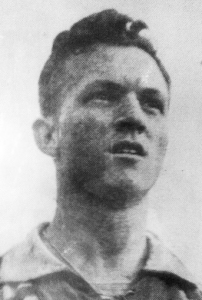 At 26, Gormley was in his prime in 1944, and his goal scoring exploits led the A’s to their second ASL title. His 16 goals were second in the league—but the 14 assists he also added led the circuit in that category. Although an MVP trophy was not awarded that year, it appears Gormley would have been a shoo-in, having contributed to just over half of the team’s 59 goals. Once again, Lewis Cup and U.S. Open Cup goal totals are not available, so it’s possible Gormley broke the 20 goal mark in all competitions that year. Nanoski and Gormley combined 30 of the American’s 59 goals in 1943-44, also recording 13 and 14 assists, respectively. Talk about a dynamic duo. Joining Bob Gormley and Duke Nanoski as the only player to appear more than once on the list is Tommy Oliver, leading scorer for a disappointing Nationals side that season. Speaking of Gormley, here he is again, holding down the ninth spot on the list. In 1948, his 13 markers led the A’s to their fourth ASL title in seven years. This time he finished third in the league in goals—behind Baltimore’s Nick Kropfelder (19) and future U.S. World Cup hero Joe Gaetjens’ 14 goals for Brookhattan. As good as he was, the relative lack of international play by the U.S. during the era meant he did not receive his first (and only) cap until 1954. Gormley was inducted into the U.S. Soccer Hall of Fame in 1989. And back again is Mr. Gormley. Incidentally, his 12 goals in 1947 did not even lead his own team in scoring—Irishman Ray Kelly paced the Americans with 14 goals. Born in Philadelphia in 1946, Duccilli graduated from Germantown High School and attended Temple University, starring in soccer every step of the way. He still holds Temple’s record for goals in a career with 66 goals from 1965 to 1967. He was inducted into the Temple Hall of Fame in 1983. 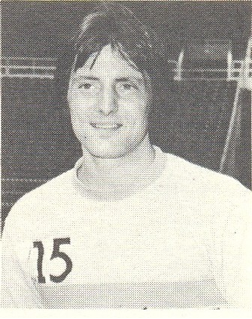 In 1971, Duccilli appeared with the Philadelphia Spartans in the ASL, the spiritual successors of the old NPSL squad. Duccilli led the league in goals with 11 on a mediocre club. He scored five goals, and added five assists, to also lead the ASL in scoring in 1972. In 1973, he joined the North American Soccer League’s Philadelphia Atoms, appearing in four games and scoring one goal for the league champions that year. He jumped to the ASL’s Delaware Wings in 1974, appearing as a player-coach, and ended his career with the ASL’s New Jersey Americans (based in Wall Township, NJ) in 1976. After his playing career ended, he served as head coach of the Kennedy High School (Willingboro, NJ) soccer team, and in 1984 became the first coach of the Rutgers women’s soccer team. In 2002, he served as head coach for the New York Power of the Women’s United Soccer Association. The son of Philadelphia and U.S. soccer legend Walter Bahr was drafted by the Atoms with their first round pick in 1975, and the young midfielder immediately established himself as one of the top young American stars of the era. 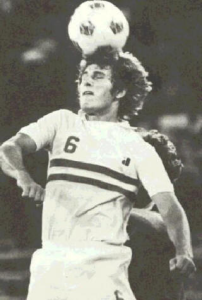 With 11 goals, Bahr tied the record for goals in an NASL season for a native born American (Joe Fink—NY (1973)), and went on to be a near-unanimous selection as NASL Rookie of the Year in the Atoms’ penultimate season. Bahr had two 2-goal games and four game winners that season. The former Penn State star and Neshaminy High School grad also appeared on the 1976 U.S. Olympic soccer team, scoring both goals in a 2-0 win in a qualifier over Bermuda. Alas, this was the only season of professional soccer Bahr would play—you see, he was also a very good kicker with the Penn State football team and, in 1976, was drafted by the NFL’s Cincinnati Bengals in the second round (51stoverall). He was named to the 1976 NFL all-rookie team, and the Sporting News all-AFC team in 1977. He also kicked for the Los Angeles/Oakland Raiders and San Diego Chargers before calling it a career in 1989. So there you have it—although he has cooled lately, MacInerney is well-within striking distance of everyone but Patendaude and Ferris. His chase should make for an interesting second half of the season. The list is for American-born goalscorers (something for which BSFC was never particularly well-known) on Philly teams. Steve has done previous posts in which Bethlehem and Stark are prominent, notably his look at Scottish players in Philadelphia area teams and his post on where Wondolowski stands the greatest goalscorers in American soccer history. I think Tim was referring to my remark earlier in the article, when I listed foreign-born guys who have led Philly teams in scoring. You read my mind, Steve, even if I wasn’t too clear in my comment. I enjoy your work, and was thinking exactly that. I had my practice in Allentown for years,and never really believed that it was all that far from the Philadelphia region. Bethlehem is the team that even the Union has incorporated into their history with the alternate uniforms, and this old Atoms and Fury fan wouldn’t want to lose that connection.